Welcome back to another post about Britain’s most popular sweets. Scroll below for the history and facts you need to know about the most delectable sweets of the 1930s and the 1940s. Fizzy cola bottles are sour, chewy cola gummies made from gelatin dipped in sugar. They are an essential part of the classic pick ‘n’ mix selection and were first produced in the 1930s. Now they come in all different flavours and sizes including: fizzy cherry cola bottles, cherry cola bottles, giant cola bottles and giant fizzy cola tubs! Parma Violets are little blue discs. They are named after the violet flower of Parma, Italy, which it takes its flavour from. Parma Violets were launched in the 1940s by Swizzels-Matlow company although Internet rumours claim they were invented by the scientist Michael Faraday. Kola Kubes are solid Cola flavoured cubes that were created by the company Pascall in the 1940s. The original Kola Kubes however, had a chewy centre unlike the ones more commonly found now. Did you know? Kola Kubes were also commonly used by parents to keep children quiet. To the parents reading this: buy your Kola Kubes now! $30 HK per 100g is not much in exchange for some peace and quiet after all. Pink Shrimps were originally created by Barratt’s in the 1940s. Pink Shrimps come from the same Barratt family as Flumps, Milk Bottles and Strawberry Milkshakes. Don’t worry, they don’t actually contain shrimps or taste like shrimps. In fact, they are soft fruit flavoured chews that are only shaped like shrimp. Just as Bubba from Forrest Gump puts it, “Shrimp are the fruit of the sea”. What’s more, Pink Shrimps are even Gluten free! So follow in Forrest Gump’s footsteps, run to our nearest store and buy your shrimps! 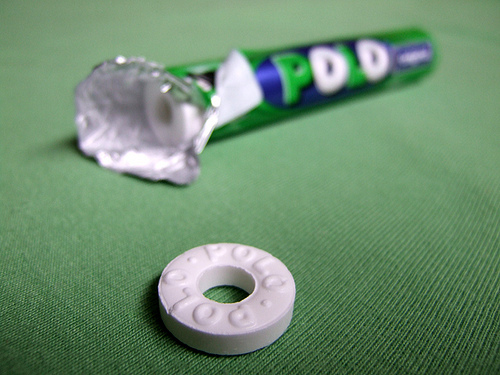 Polo Mints are similar to the American sweet “Life Savers”. They were first sold in 1948 but were actually intended to be launched in 1939. Their launch was delayed because of the war. Apparently, the mints are shaped under immense pressure equivalent to two elephants jumping! Come back soon for more blog posts to come in the following weeks focusing on sweets from the 1950s and onwards. While you’re waiting for the next blog post come visit our stores in Central and Wanchai and buy yourself some Fizzy Cola Bottles, Parma Violets, Kola Kubes, Pink Shrimps and Polo mints.